“A dangerous time for peace”. Two years ago that is how I described the situation in Colombia in a piece for union-news.co.uk about our Justice for Colombia (JFC) delegation in November 2016, immediately following the signing of the Peace Agreement intended to resolve decades of conflict. Nearly two years on, I returned to a situation that is even more fragile and volatile. I was part of a JFC Peace Monitor delegation to observe the state of implementation of the peace agreement and the broader human rights situation. We were disturbed to find many areas where the Peace Agreement has been undermined or not implemented. The killings continue, with a shocking 148 social leaders murdered so far in 2018. The Peace Agreement guaranteed seats for the FARC as a newly constituted political party as part of the reincorporation into civil society. One of the members of Congress under that agreement is Jesus Santrich. He has been prevented from taking up his seat following his arrest and imprisonment. Jesus is under threat of extradition to the United States despite no evidence being presented against him. Jesus is blind. He is being held in isolation in prison and denied access to basic equipment. He has been prevented by the Attorney General from swearing in as a member of Congress. Jesus is entitled to have his case considered by the Special Jurisdiction for Peace established under the Peace Agreement, the JEP. The government has made every effort to block this, but the Constitutional Court has ruled that the JEP must be allowed to review the evidence against Jesus. We heard concerns about the delays in setting up the JEP and in its ability to operate free from government interference. Jesus’ case is a fundamental test of the right to political participation and the validity and independence of the special jurisdiction. It is crucial that both of those pillars of the peace process are fully implemented in order for the process to succeed. Another key component of the peace process is the establishment of 26 zones in which former combatants are to be reincorporated into civil society. We visited one of those areas, Filipinas in the oil-rich Arauca region. We saw for ourselves how the government has failed to provide the basic resources necessary for reincorporation to succeed. Filipinas is only accessible by a rocky unmade track which becomes impassable in the frequent heavy rain. This makes it virtually impossible to gain access to necessary education and healthcare or to local markets to sell produce. 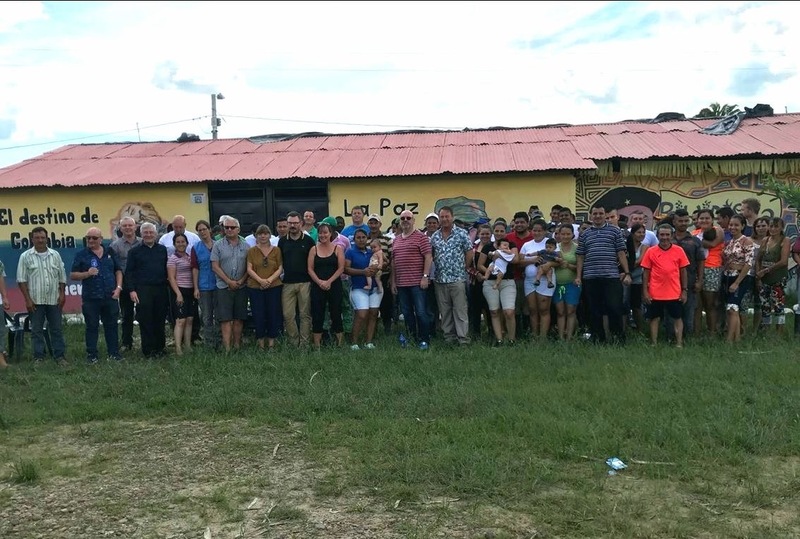 In Tibu near the Venezuelan border we heard about the lack of implementation of the voluntary crop substitution programmes intended to replace the cultivation of illicit coca with legal crops such as maize and chocolate. The lack of implementation, lack of resources and lack of infrastructure prevents locals from making a living from substitute crops and risks undermining the move away from coca growing. This is accompanied by the continued threat of paramilitaries and guerrillas from the ELN and the EPL. Local communities are under threat, suffering killings and violence, and the police and army are unable to provide effective protection. This already volatile situation has been inflamed further by the election as President Ivan Duque, a right-winger who stood on a platform critical of the peace agreement. Despite this, the leadership of the FARC, the opposition parties in Congress, the trade unions, human rights groups and indigenous organisations remain committed to the peace process and are pushing for full implementation. They all stressed to us how important it is that the international community continues to play a part in supporting the peace process and encouraging the Colombian government to fulfil its commitments and secure a lasting peace. The trade union and labour movements in Britain and Ireland have played a major part in this and it is vital that we continue to do so. ← Solidarity for the summer!